For National Volunteer Week, April 8-12, we’re highlighting a few of the many volunteers that make our work possible. Each day, we’ll add another volunteer to this post. Volunteers’ donation of time and talent helps Boys & Girls Clubs of Metro Richmond make a difference in the lives of young people. For more information on volunteer opportunities, email us at volunteer@bgcmr.org. If you’ve stopped by the Southside Club in the last two years, chances are you’ve seen the Southside Striders. The running club, led by Coach Mike, meets twice per week, learning about the fundamentals of running, goal setting and staying active. Being an ex-Marine, Coach Mike has always enjoyed exercise, so started to get more involved with the amazing running community in Richmond. A couple years ago, he helped raise money for Sports Backers’ annual Kids Run RVA event. Mike was interested in seeing who the participants he helped were and decided to watch the race. "I absolutely loved watching their facial expressions as they started running,” he recalled. It was at that moment he realized he wanted to share his passion for running and competition with kids. Naturally, Boys & Girls Clubs of Metro Richmond was a perfect fit. Coach Mike wants to help more youth participate in Richmond races and conveys a philosophy to the members of always keep moving forward. After moving back to Richmond a few years ago, Nancy was looking to get involved in the community. She met the staff at Boys & Girls Clubs of Metro Richmond and felt it was a good organization to support. “I really liked what BGCMR was doing for young people and how they were focused on getting results in career and college readiness,” she said. Nancy excitedly signed on as a volunteer. During her time with Boys & Girls Clubs of Metro Richmond, Nancy has worn several different hats, but her work has always been centered around teen members. When she first started more than a year ago, she led a program around her favorite hobby – crocheting – at the MLK, Jr. Middle School Club. Nancy also has used her professional expertise in leadership development in her work with the teens. Most recently, she helped the Youth of the Year participants understand their leadership style and explore careers using the Birkman Method© which was sponsored by her employer, Burton-Fuller Management. One of her most memorable experiences came from her first crocheting program. She had high hopes for what the group was going to accomplish, setting an ambitious goal of a creating a blanket in nine weeks. When she realized that most of the group had never picked up a crochet hook before, it became more about the process than the finish. During the class, Nancy connected with two brothers, having insightful conversations with them while they were making things. “I am so proud of them! They stuck with me the entire time and never missed a session. I was impressed that they never quit and never gave up and that trait will serve them well in the future. ” she said. Finding the right opportunity at the right place is the goal for any volunteer. Kenya knew that she wanted to find a volunteer opportunity in which she could engage with young people freely rather than in a highly structured setting. Seven months ago, she attended a volunteer information session at Boys & Girls Clubs of Metro Richmond and it seemed like a good fit. Kenya soon began volunteering at the Fairfield Court Club twice a week, arriving at dinnertime to help prepare and serve meals and to supervise after dinner activities. She really enjoyed the time she spent with the members and staff. But, when did Kenya know that the Club was, in fact, the right place for her? 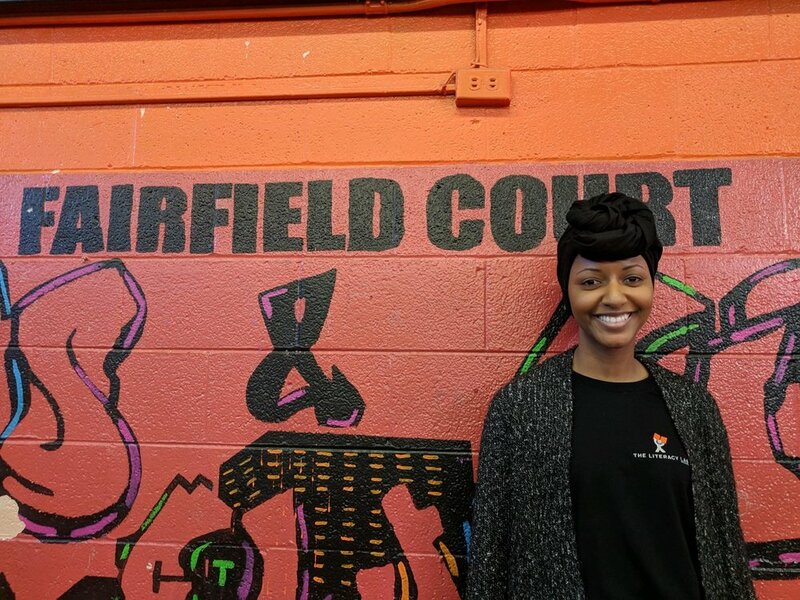 For Kenya, who works as a literacy tutor, the best part of her volunteer experience has been the connections she has made with the young people at Fairfield Court. During one of his first days volunteering at Northside, there was a lull between activities. Stephen looked around the room and saw an empty seat at a table of young people. He introduced himself, sat down, and began to learn their names. He then decided to challenge them with a riddle. That sparked something within the group and soon, they were creating and solving their own riddles. Since then, Stephen has been coming to Northside twice per week. He helps where he’s needed on a given day, but his usual activities include helping with STEM programming, supervising outdoor sports, and one-on-one homework help and tutoring. With the STEM group, Stephen is helping them with a community garden, as they learn about different plants and all the different factors to consider when deciding what to grow. He also helps with a variety of sports, playing alongside the members whenever possible, teaching them important lessons in teamwork along the way. He’s also been working with a second grader who has been struggling with his homework. When Stephen arrived at the Club in January, the aspiring physician had been searching for a volunteer experience that would allow him to work closely with people and broaden his worldview. It has grown into much more than that.